Register to Log In as Dealer to see your store cost! Note: All initial orders are verified to be legitimate businesses prior to shipment. Please make sure we have your correct business email and phone number. Limit 1 per store. Shipping notification upon completion of order processing! Exclusive dealer notifications of specials and other information! *Opening first order is 48 pair per season, after that no minimum required. Orders less than 12 pair are charged $12 shipping. We verify all new wholesale accounts usually the same day we receive your order. Once we've verified your business, your order will be shipped usually that same day. Gurkees dealers are no longer authorized to sell Gurkee's on the internet. Gurkees is now in the process of having unauthorized web sites removed. We do not drop ship orders to your customers. Orders are processed immediately during business hours. Evening and weekend orders are processed next business day. Delivery is generally 2-4 business days from ship date. Gurkees sandals are hand made. During peak times, we sometimes run out of a certain style, or color in a particular size. We will not hold up your order but will call you to inform you of out of stock items so your order can be modified. 30 Day Manufacturer guarantee... Gurkees.com guaranteed to fit policy does not apply to wholesale orders. We do not have a guaranteed to fit policy on wholesale purchases since you would just put the pair that doesn't fit back on your shelf and sell a larger size. There are no returns on products purchased at wholesale other than defective products. Internet Sales & Web Sites are not allowed. We do not allow our trademark (Gurkees) to be used when registering domain names. This includes misspellings and other variations. RS Marketing LLC, DBA Gurkee's reserves all rights to it's trademarks and service marks. The Gurkee's Trademark, name or image may not be used in a distasteful way, to defame or misrepresent. 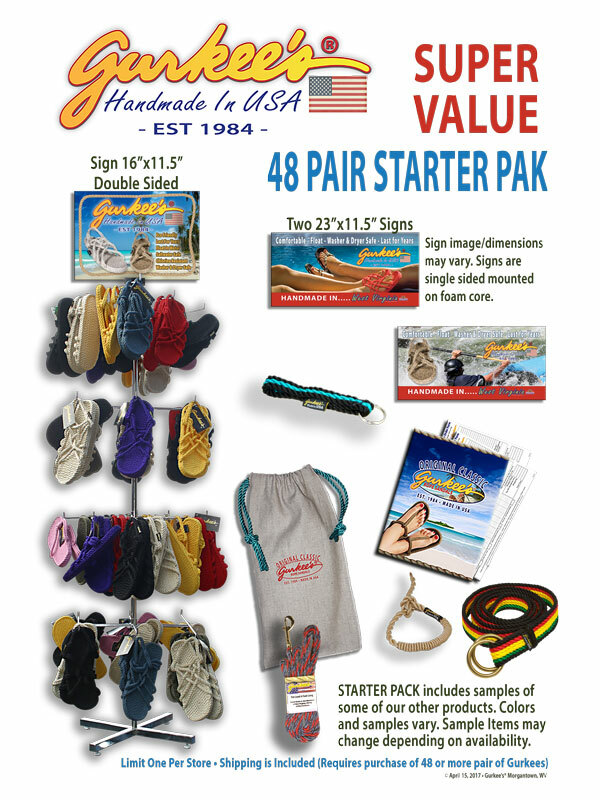 Gurkee's Rope Sandals are a quality product and handmade in the USA. All dealers must agree to maintain advertised display pricing no less than 90% of the price shown on this web site including shipping in order to maintain your Gurkee's distributorship. Dealers who advertise lower prices or knowingly sell to dealers who advertise lower prices will be denied future orders. *Note... dealers can sell for any price desired... The restriction is only considering advertised pricing, not actual sold price. I understand and agree to the paragraphs above.